“Don’t let money be a dirty word,” says Naomi Bishop (Anna Gunn), steely senior investment banker at Remson Partners, as she gives a talk at a wine-and-cheese mixer of Manhattan businesswomen. It’s not quite Wall Street’s “Greed is good,” but it doesn’t have to be. 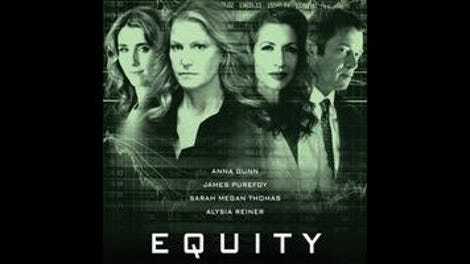 Equity may not be the fanciest or flashiest of financial thrillers—more like off-brand David Fincher or Steven Soderbergh—but it gets the job done. Its major players are all women trying to make careers in boys’ club professions (yes, the title is a play on words); that’s all the motivation the movie offers and perhaps all that it really needs. It skips past the usual handwringing over the temptations of capitalist wealth and just gets right to the risk-taking and double-crossing, assuming (rightly) that viewers don’t need a character to have a backstory, a tragic secret, and a dead spouse, best friend, or parent to understand why they’d do anything to hold on to a career. Naomi has already been betrayed by the time the story starts—scapegoated for an IPO that didn’t pan out as expected. Her last chance is to make an even bigger gamble, on a privacy-focused social media platform called Cachét that’s ready to take its stock public. At an alumni meet-and-greet, she reconnects with college friend Samantha (Alysia Reiner), a manipulative federal agent who has recently swapped drug trafficking investigations for white-collar financial crime to be closer to her wife and kids. Right now, Samantha’s focused on Michael Connor (James Purefoy), a louche Remson hedge fund deal-maker who just happens to be Naomi’s on-and-off paramour of many years. The audience will be able work out where all this is going well in advance. Films about money are never subtle, and Equity does nothing that assorted cautionary tales about success haven’t done before; heck, it even has an All About Eve-esque subplot involving Naomi’s assistant, Erin, played by Sarah Megan Thomas, who worked on the story for playwright Amy Fox’s script. But the plotting is cynically expedient. It recognizes that Naomi doesn’t need an off-putting personality for a viewer to buy that her professionalism “rubs some people the wrong way” (in the words of her boss) and that no explanations are necessary for why she and Erin have to keep talking business while their Silicon Valley clients bro around or why the two well-bred young male execs that Naomi recommends firing at the beginning of the movie are still there at the end. To put it another way: It’s not the clichéd, anti-climactic plot but the way it falls into place with minimal motivation that’s the point. That awareness of limited options is underscored over and over by director Meera Menon’s clinical camera style, with shots framed around the angles and far corners of conference rooms and posh condos, washed in cold tones and jaundiced yellows. There are only one or two handheld shots in the whole film, which gives Equity a stiff-backed, observational quality, as though the camera were sometimes staring at the characters, waiting for the moment when they’ll stumble. Every now and then, Equity rewards with a touch that reminds that all of this overfamiliar law-versus-greed wheeling-dealing is being seen from an unexplored side—say, an executive, pregnant but not yet showing, secretively replacing her martini with water to blend in at a rowdy all-male professional happy hour.